The US is suing Volkswagen, accusing the German carmaker of "massive fraud" over the diesel emissions scandal. The Securities and Exchange Commission (SEC) claims the firm misled investors by issuing billions of dollars worth of bonds and securities, without disclosing that it had cheated emissions tests. 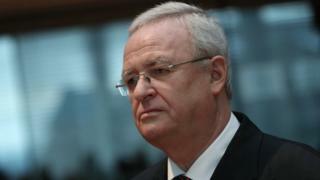 Volkswagen's former chief executive Martin Winterkorn is also being sued. VW first admitted in September 2015 that it had used illegal software to cheat US emissions tests. But between April 2014 and May 2015 the carmaker sold $13bn (£10bn) of bonds and securities to US investors, at a time when executives were already aware that illegal software had been installed to manipulate emissions tests, according to the SEC's suit. The SEC said that as a result, Volkswagen "reaped hundreds of millions of dollars in benefit by issuing the securities at more attractive rates for the company". When the scandal was uncovered, VW's share price sank nearly 40%. The firm "repeatedly lied to and misled United States investors, consumers, and regulators as part of an illegal scheme to sell its purportedly 'clean diesel' cars and billions of dollars of corporate bonds and other securities in the United States," the SEC added. The suit also seeks to recover "ill-gotten gains" along with civil penalties and interest. "We're not yet through the diesel scandal, it will probably still take years... and it's a burden for us." That is what VW's chief executive Herbert Diess had to say when I spoke to him at the Geneva Motor Show last week. It has already paid out more than $30bn in the US alone, in fines and other penalties, and to buy back affected vehicles. The SEC's lawsuit shows that the US authorities are not prepared to let the company off the hook just yet. It remains under pressure in Europe too - where it is still facing a waveof consumer lawsuits over its refusal to pay compensation. Ironically, as Mr Diess acknowledged, the scandal forced Volkswagen down a path which may help it become a leader in more environmentally-friendly technologies. The firm said in a statement the SEC complaint was "legally and factually flawed". It said the securities in question had been sold "only to sophisticated investors who were not harmed and received all payments of interest and principal in full and on time" and said that Mr Winterkorn had played no part in the sales of those securities. The carmaker is already defending its actions in court in Germany, where investors are pursuing €9.26bn (£8.2bn) in damages, arguing the company should have come clean earlier about the emissions tests cheating. That case is expected to last until later this year.